The iPhone 6 series has been discontinued by Apple; this article remains for reference purposes. Here's a list of all the iPhones including the most current. There are all sorts of buttons, switches, and ports on the outside of the iPhone 6 and iPhone 6 Plus series phones. Experienced iPhone users will recognize most or all of them — though one familiar and crucial button has been moved to a new location on these models. Other than their screen size, physical size, and thickness, the iPhone 6 and 6 Plus phones are virtually identical and they have the same buttons and ports. Because it's involved in so many functions, this is probably the button pressed most often by iPhone users. The Home button has the Touch ID fingerprint scanner built into it for unlocking the phone and making purchases with ApplePay. It's also used to return to the home screen, access multitasking and favorites, quit apps, take screenshots, and reset the phone. This 1.2-megapixel camera is used for taking selfies and for FaceTime chats. It also records video at 720p HD resolution. While it can take photos and videos, it doesn't offer the same image quality as the back camera and lacks features like slow-motion video, time-lapse photos, and taking photos while recording video. When you hold the iPhone to your ear for phone calls, this is the speaker through which you'll hear the person you're speaking to. This is the primary camera on the iPhone 6 series. It takes 8-megapixel photos and records video at 1080p HD. It captures time-lapse and burst photos and records slow-motion video at 120 and 240 frames per second (normal video is 30 frames/second). On the iPhone 6 Plus, this camera includes optical image stabilization, a hardware feature that delivers higher-quality pictures by reducing the effect of hand movement. The 6 uses digital image stabilization, which attempts to replicate hardware stabilization via software. When you're recording video, this microphone captures the sound that goes along with the video. The camera flash provides more light for photos and videos. Both the iPhone 6 and 6 Plus use the dual-flash system introduced on the iPhone 5S. Having two flashes instead of one delivers better color accuracy and photo quality. The lines across the top and bottom of the back of the phone, as well as on the edges of the phone, are the antenna used for connecting to cellular phone networks to place calls, send texts, and use wireless internet on 4G LTE networks. Headphones of all kinds, including the EarPods that come with the iPhone, are plugged into this 3.5-mm jack on the bottom of the iPhone 6 series. Some accessories, such as car FM transmitters, are also connected through the headphone jack. This next-generation dock connector port (first introduced with the iPhone 5) charges the iPhone, syncs to a computer, and connects to some car stereo systems and speaker docks, as well as other accessories. The speaker on the bottom of the iPhone 6 series is where ringtones play when a call comes in. It's also the speaker that is used for talking on speaker phone, as well as playing audio for games, movies, music, etc. (assuming that audio isn't being sent to headphones or an accessory like a speaker). Put the iPhone into silent mode using this switch. Push the switch down (toward the back of the phone) and ringtones and alert tones will be silenced until the switch is moved back to the "on" position. Raise and lower the volume of the ringer, music, or other audio playback with these buttons. Volume can also be controlled using in-line remotes on headphones or from within apps (where available). 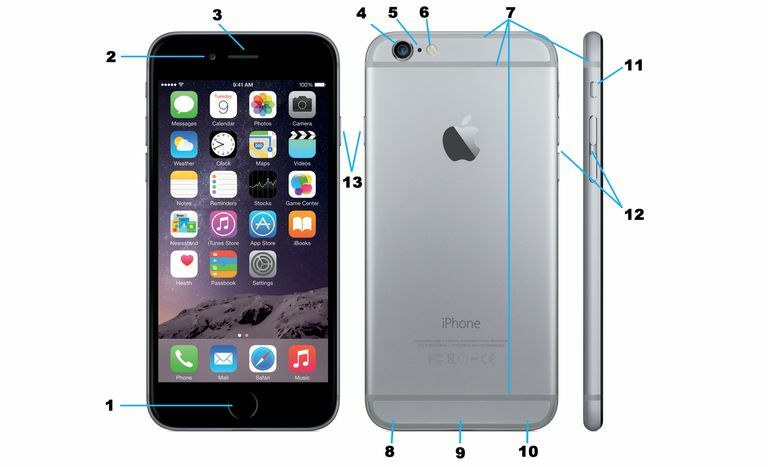 This is the major change from the traditional iPhone hardware layout introduced in the iPhone 6 series. This button used to be on the top of the iPhone, but it's been moved to the side thanks to the larger size of the 6 series, which would make it difficult to reach for many users. This button is used to put the iPhone to sleep/lock the screen, to wake it up, and to take screenshots. Reset frozen iPhones using this button and the Home button.